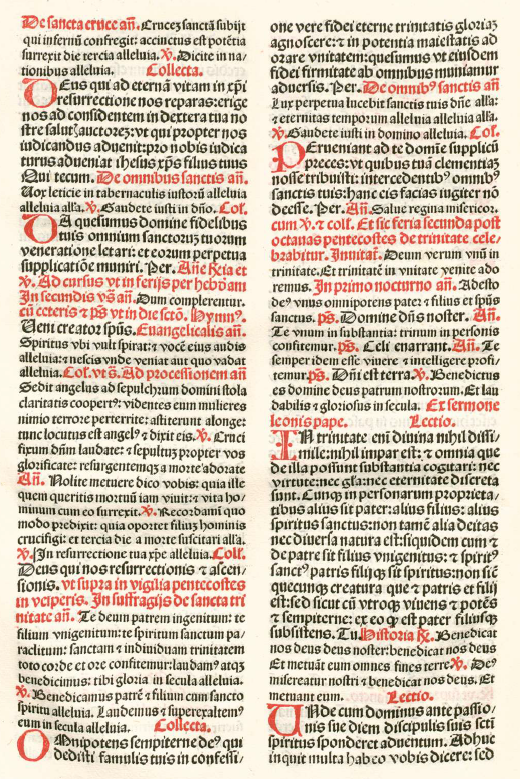 In the traditional Roman Divine Office, the only Hours which change their Psalms according to the specific feast day are Matins and Vespers. On the majority of feasts, the first four Psalms of Vespers (109-112) are taken from Sunday, but Psalm 113, the fifth and longest of Sunday, is substituted by another; on the feasts of martyrs, by Psalm 115, on those of bishops by 131, etc. There are, however, four occasions on which Psalm 113 is not replaced, three of which are very ancient indeed, and the fourth relatively recent in origin. The latecomer is the feast of the Holy Trinity, which was first instituted at Liège in the 10th century, and spread from there very slowly. Pope John XXII (1316-34) ordered that it be celebrated throughout the Western Church on the Sunday after Pentecost, a custom which became universal after Trent; however, even as late as the mid-16th century, the Low Countries and several major German dioceses kept that day as the Octave of Pentecost, and put Trinity on the following Monday. The use of Psalm 113 at Second Vespers is a reminder of the day’s previous status as either the octave of Pentecost, or the first of the ordinary Sundays after it. The three ancient feasts are Easter, Pentecost and Epiphany, on which it is said on the day itself and through the octave. (Some medieval Uses, however, vary this.) This custom reflects the traditional baptismal character of these celebrations, which go back to the very earliest days of the Church. The Psalm numbered 113 in the Septuagint and Vulgate is really two Psalms joined together, those numbered 114 and 115 in the Hebrew. It is the first of these which speaks of the passage of the Jews out of Egypt, and then of the Crossing of the Jordan into the Holy Land. The Church has always understood the story of the Exodus as a prefiguration of salvation in Christ, and specifically, the Crossing of the Red Sea as a prefiguration of the Sacrament of Baptism. The reading of the relevant passage from Exodus is attested in the very oldest surviving homily on the subject of Easter, the Paschal homily of St Melito of Sardis, from the mid-2nd century; it begins with the words “The Scripture about the Hebrew Exodus has been read”, and this custom continues into every historical Christian liturgy. 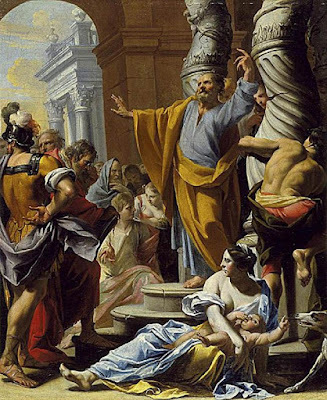 Following the lead of St Paul, who says that the rock which provided water to the children of Israel in the desert was Christ (1 Cor. 10, 4), St Melito attributes all of the events of the Exodus directly to Him. Psalm 113, therefore, which speaks of the Red Sea fleeing to make passage for the children of Israel as they go out of Egypt, and the rock that becomes a pool of water, is perfectly suitable to the two most ancient feasts on which the Church celebrates the Sacrament of Baptism, Easter and Pentecost. Likewise, on Epiphany, the Church commemorates the Baptism of Christ in the waters of the Jordan, to which the Psalm also refers. 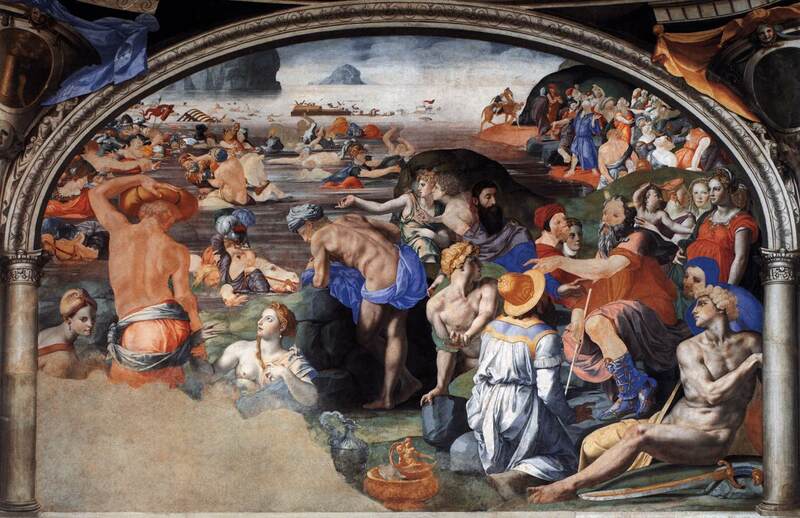 The Crossing of the Red Sea, by Agnolo di Cosimo, known as Bronzino, 1540; from the Chapel of Eleonora of Toledo in the Palazzo Vecchio, Florence. 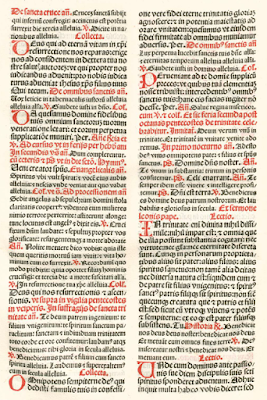 Matins of Pentecost, like those of Easter, has only three Psalms; these are 47, 67 and 103 according to the Vulgate numbering. The antiphon sung with Psalm 47 is not taken from it, but from the Acts of the Apostles (2, 2): “There suddenly came a sound from heaven, as of a mighty wind coming, alleluia, alleluia.” The psalm seems to have been chosen because of the words of its first verse, “Great is the Lord, and exceedingly to be praised in the city of our God, in his holy mountain.”, the city of our God being Jerusalem, where the first Pentecost took place. And likewise, the second verse, “With the joy of the whole earth is mount Sion founded”, may be referred to the preaching of the Gospel to all nations, which begins on Pentecost. The third Psalm, 103, describes the glory of God throughout His creation, drawing us back to the very beginning of the Bible, when God created the heaven and the earth. “Who stretchest out the heaven like a pavilion … Who hast founded the earth upon its own bases.” It is sung with an antiphon from verse 30 which makes it obvious why it was chosen, “Send forth thy spirit, and they shall be created: and thou shalt renew the face of the earth, alleluia, alleluia.”, for the renewal of creation at the coming of the Holy Spirit is also celebrated at Pentecost. The Byzantine Rite expresses this idea of renewal very beautifully in the traditional icon for the feast. At the bottom is placed the figure of an aged king, who represents the world grown old in sin and idolatry, and living in darkness. In the cloth in his hands are scrolls, which represent the teaching of the Apostles, by which he will receive the Gospel and the renewal of the Holy Spirit. All four of the Evangelists are included among the Apostles, as is St Paul, even though Mark, Luke and Paul were not present at Pentecost. (They are the five shown holding books.) This demonstrates that the Holy Spirit continues His mission in the Church even after the day of Pentecost itself. The other Apostles are holding scrolls, representing their role as the Church’s teachers. St Peter’s Eastern Catholic Church in Ukiah, California, decorated for Pentecost this year. This is famously one of the most difficult texts in the entire Psalter. There are a number of lines which are very hard to understand, and endless emendations have been proposed for the Hebrew. These difficult readings carry over into its first translation, the Septuagint, and thus to the Vulgate, which derives from it; a good example is verse 14, “If you sleep among the midst of lots, you shall be as the wings of a dove covered with silver,” But even where the individual lines are perfectly clear, the psalm as a whole is not; indeed, the thought of it is so disjointed that some Biblical scholars have proposed that it was not originally written as a psalm at all, but rather as a list of titles of psalms which are now lost, or a collection of their first lines, or a collection of fragments. The regular psalms of Sunday Lauds (92, 99, 62-66, the Benedicite, and 148-149-150) were traditionally said on all feast days in the Roman Rite. In the reform of St Pius X, psalms 66, 149 and 150 were, lamentably, removed, but the group thus reduced continued to be used on all major feasts, including Pentecost. The psalms of the day hours were likewise traditionally invariable for all feasts (53 and the eleven parts of 118), and those of Compline always invariable; this was also changed in the reform of St Pius X, but not in a way that applied to major feasts like Pentecost. There are four places where the Psalms are joined or divided one way in the Hebrew and another in the Greek. There are also psalms which both traditions have as a single text, but are generally believed to be two joined together, (e.g. 26), and others which both traditions have as two (41 and 42), which are generally believed to have originally been one, later divided. It is quite possible that these variations come from ancient liturgical usages of which all knowledge has long since been lost. Likewise, the meaning of many words and phrases in the titles of the Psalms had already been lost when the Septuagint translation was made in the 3rd century B.C.